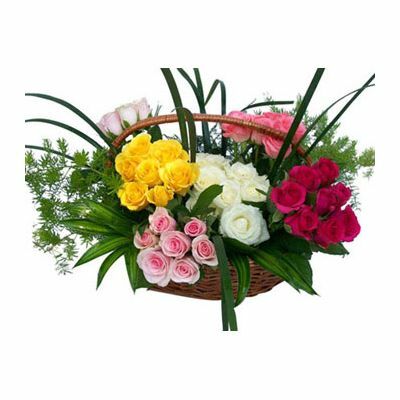 Say it all with our colorful bouquet of 40 Mixed Roses basket. 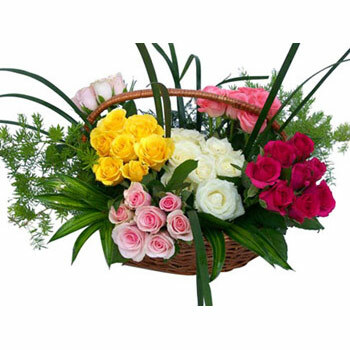 Our creative florist has especially put together vibrant colored roses with greenery and fillers in a basket. This lovely bouquet of 40 Mixed Roses is extremely pretty and the color combination is quite eye catching. It is the best way to make someone’s day really special. Our 40 Mixed Roses bouquets our ideal for Baby Showers and Retirements and make an excellent gift for your boss too. Consider for: Birthday, Wedding Day, Anniversary, Baby Showers, Retirement, Mother's day, Father’s Day, Gifts For Boss, Gifts For Him, Gift For Her, Valentine's day. We Offer Home Delivery Service for flowers including same day delivery and midnight delivery. Home Delivery | Send Flowers | Flower Bouquets | Florist | Same Day Delivery | Midnight Delivery.